Abandoned church near the cemetery in the Buckhorn, Iowa ghost town. Pilot Charlie Kern liked teasing the two veteran skydivers, but they’d proved their courage hundreds of times. 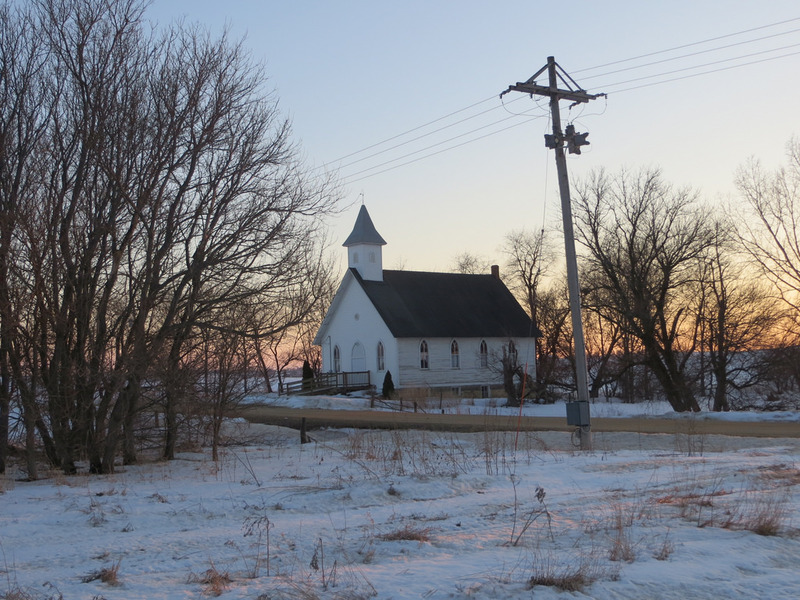 The Cessna 172 approached the dirt road lightly covered with snow opposite an abandoned church. Paul Lambert stood in the old Buckhorn cemetery looking at their graves. They crashed fifty years ago a few hundred yards away. As their closest friend, his Dad Chuck had them buried here. Paul paid his respects and listened as the ghosts of Charlie, Ted McKeever, and Jim Buckley re-enacted their final moments on the anniversary of their last flight. Somewhere above, he could hear the laboring engine of a Cessna fighting to stay in the air just a few seconds longer. I wrote this for the What Pegman Saw flash fiction challenge. The idea is to take a Google maps image and location and use it as the inspiration to craft a piece of flash fiction no more than 150 words long. After much editing, my word count is 150. Buckhorn is a ghost town, located in Jackson County just off of Highway 64. Some quick research reveals that it was a farmers’ cooperative founded early in the 20th century, and then was bought out by a large dairy in 1962. All that is left of it is a cemetery, an abandoned church, and this building, the old Buckhorn Creamery. Okay, not much to go on. I looked up Buckhorn on Google maps and it’s not particularly isolated. In fact, it’s only about a third of a mile from the Maquoketa Municipal Airport. I thought about doing a historical piece, but even consulting several sources, I couldn’t find out when the airport was established. However, looking at the airport’s official website gave me an idea, but I’d have to monkey around with history to pull it off. When I was a kid, I watched a TV show called Ripcord starring Larry Pennell, Ken Curtis, and Shug Fisher. The show ran from 1961 to 1963 and depicted the adventures of two expert skydivers (Pernell as Ted McKeever and Curtis as Jim Buckley) who did everything from perform dangerous aerial stunts to capturing bank robbers, always with the climax being jumping out of an airplane and going into free fall. Skydiving was new back then and the sport had just become incredibly popular, which is probably what kept the show going for its two-year run. Actor Paul Comi played the original pilot Chuck Lambert but he was replaced in the middle of the first season by Shug Fisher as Charlie Kern. I got all these details from Wikipedia and decided to run with it, making their last flight in 1963 or ’64. Not sure if Buckhorn was a ghost town by then since it had only been bought out in 1962, but here’s where I fudge history. In my imagination, Kern was trying to make Maquoketa Municipal Airport, but again, I have no idea if the airport even existed back then. I created the character Paul Lambert, Chuck Lambert’s son, who would be in his early to mid 60s in 2017 combining actor Paul Comi’s name with his character’s in order to complete my ghost story. I know. My explanation is longer than the story itself, but it was fun tying all this stuff together. Beautifully crafted story, James. You caught a wistful, valedictory mood for both characters and town. Thank you, Penny. That’s certainly high praise. OK, James — As a pilot, I must take issue with technical aspects of your story. You’re not alone in your apparent ignorance of what makes a plane fly or what kinds of problems are likely to interfere with a safe landing. Your symptom of dropping oil pressure merely suggests that the engine was likely soon to quit; but apparently it had not yet done so and was merely “laboring”. Nonetheless, even if it had seized completely, a plane of that type is fully capable of gliding to a safe landing with no power at all, though it might not have had sufficient altitude to reach an airport runway. Depending on whether a straight stretch of road might be available with no obstacles, a normal landing could be achieved. Similarly, an empty farm field could suffice, though hidden roughness, say under snow, could be a problem that would destroy the undercarriage or even flip the plane onto its nose. In such a case, the accident would be not unlike a skidding car crash at something less than 40 mph. The mandatory seatbelts might well have limited any injuries. Consequently, I’m left to wonder what was the cause of the three deaths mourned in your story. An experienced skydiving pilot could be expected to have sufficient experience to handle such an off-airport landing successfully. Gliding to a landing without power is part of the standard private pilot curriculum and recurrent testing. Now, landing in a forest could present a problem. Trees are somewhat unforgiving of airplane incursions. But you didn’t mention any such. A narrow road with obstacles on one or both sides might rip the wings off, as could also occur if the plane were driven into an open barn through its doors. But this would actually tend to reduce the speed fairly safely, despite the damage to the aircraft. You didn’t describe any hint of a problem that could actually kill the occupants of that plane, because airplanes don’t simply fall out of the sky. An aerial collision between two aircraft, that damages the flying surfaces of the wings or tail, or some event that renders the pilot unconscious, would be required to do that. It would be highly unlikely for the pilot to have flown the plane to a collision with the old church building, or into the cemetery with its headstones. Even unseen electrical or telephone wires above and across the road would likely break without causing anything worse than the crash in a field that I described above. I hope this information explains why I find this story quite unbelievable, and somewhat insulting. Thus also I am somewhat distracted from appreciating other features of its storytelling. Oy. For 150 words, I didn’t do exhaustive research PL. I can assure you however, I wasn’t trying to be insulting. Of course as the plane was coming down, I didn’t describe the very last minute or so of its flight, so many things could have happened that would have resulted in a crash and the demise of the three occupants including a crash into the church itself. Nothing like a well spun wintertime ghost story. Great writing. Wow, I truly misunderstood the level of complexity I was involved in when I crafted my wee tale and apologize to everyone for my rather spectacular blunder. It is clear that I have much to learn. Haha. It’s not that, it’s just that when people are experts in things and they see a factual error they will call you to task on it. That’s true whether you write a 50-word story or a thousand page novel. your story works really well as a narrative and has a lot of really good emotional validity. In the end that’s what counts, especially in such a short piece. I just offered my piece as general advice for writing historical fiction based on my own experience. It’s always a risky thing to state a fact that someone else will be the expert in. I have written several short stories based on the experiences of a marine on Guadalcanal in 1942, and I’m really careful with that to make sure everything that underpins the story is factual so as not to distract from the emotion of the main character. I don’t mean to criticize what you doing at all, and I’m glad that you are participating in this prompt because your contributions are valuable and enjoyed. While I’m supplying technical details, allow me to note the difference between a certificated aircraft like the Cessna 172 in the story above, and an experimental homebuilt plane that had not yet been fully tested. Test pilots (even amateurs) have a much harder and more dangerous job than pilots of normal and utility categories of aircraft that already have been thoroughly tested and have years of successful flight history behind them. Moreover, while I certainly appreciate that James had no intention of being insulting, it is unquestionably an insult to private pilots everywhere when non-pilots presume they cannot control their aircraft and will just fly into a building or panic at the last minute or some such excuse for a crash. It’s bad enough when professionals like those at the NTSB presume pilot error because they can’t verify any other cause of a mishap. There can exist other causes that don’t leave sufficient evidence. Nonetheless, given the parameters of this story, it would almost be necessary for the engine to have virtually exploded and thrown a piston rod into the cockpit and through the pilot’s body, killing him. This one-in-a-million type of failure could incapacitate the pilot and produce a crash that killed the other two occupants as well. But a pilot just doesn’t fly into a building, or even fly toward one while trying to glide to the ground. There are so many opportunities to select a potential emergency landing site while descending, even with no power at all, that it is unreasonable to envision such an event. Even interference from weather is an unlikely culprit, given that the skydivers in the plane would have been operating in fair weather, not near encroaching storms or fog. The apparent cause of their imminent landing was engine trouble rather than worsening weather; so loss of visibility is also not a reasonable presumption to explain a crash. So, even if one of the skydivers went crazy at the last minute and attacked the pilot, thus causing the crash, I’m left with no reasonable sequence of events to support the conclusion of this story. I’m not convinced that expanding the story beyond the 150-word limit would have helped. Part of the difficulty is that I’ve read quite a number of stories and reports about aviation safety and accident investigation during the past 36 years since I obtained my pilot’s license, and I have developed some sense of how accidents do and do not occur, in order to fly safely myself by avoiding the kinds of situations that could get me into trouble and by keeping a running update of internal contingency planning to handle potential emergencies. These are standard piloting skills. Consequently when I read a story that incorporates an aviation mishap, I have certain expectations. I realize how demanding is such a position relative to writing a story where the aviation aspect is only incidental to the purpose of the story. Nonetheless, I take some pains to present this kind of aviation information and perspective when the opportunity presents itself, because public ignorance of aviation has been known to influence bad policy decisions by politicians and bureaucrats, to the detriment of the aviation industry and of individual pilots. Thus I ask everyone reading this to bear with me, please. Do small planes ever crash fatally? Is pilot error ever to blame? If the answer to both those questions is ‘Yes’, then James is completely justified in taking such an event as the basis of his story. To answer your questions with all appropriate considerations, Penny — yes, Cessna 172s and similar small aircraft can be made to crash, and some have done so, and pilots have been at fault at times. However, there are conditions that are required to make any of these things happen. Such events are rare, they are not random, and they are not as simple as mere sudden loss of oil pressure in the engine; and James’ story did not present anything hinting at such additional conditions. Therefore it did *not* justify his facile invocation of such an event. He wasn’t trying to be facile or glib, though a very short story word-limit may pressure a writer toward such shortcuts. He was simply resorting to a common sort of mistaken presumption that too-many non-aviators make. I hope my explanations in prior posts show clearly why this is frustrating and irritating to someone who knows the damage done by such misconceptions. Now, “EagleAye” suggested a plausible cause similar to one I suggested, about an unexpected encounter with a previously-unseen powerline across a road selected as an emergency landing strip. He suggested a pilot maneuvering error trying to “jump over” the powerline, stalling the lift from the wings and then falling from that height of about 50 feet, while I suggested an actual collision with the wire and some not too dissimilar results. Neither event would guarantee the death of all occupants, or even any of them; though certainly injuries may be expected in such an actual crash, which is quite different from the forced off-airport landing that an engine failure alone would produce. However, the experienced type of pilot that James described in his story is highly unlikely to have made the kind of neophyte mistake that EagleAye suggested. There are other kinds of details that James *might* have suggested, which could have made the story more plausible — and the purpose of my protest was to emphasize that one should not be facile about aviation mishaps. Those who foster aviation safety are quick to point out that accidents don’t just happen, and most of the time they can be avoided. In fact, the primary thrust of their work is to increase pilot awareness of how to avoid the mistakes and breakdowns that might cause such mishaps during any given flight, or those that have caused previous accidents. It’s to increase pilot awareness. Those of us who contribute stories are not pilots, and whether we are misinformed or not makes not a jot of difference to aviation safety. We are writers, and what matters to us are the things pertaining to our craft. Except in certain specific cases, detailed technical accuracy is neither necessary nor desirable, because including the detail will impede the story and the human emotions involved. A very ambitious story. I think you accomplished what you set out to do wonderfully. Thanks. Plus one for the ghost story at least. Much more than just a good ghost story, James. I enjoyed this. It’s a great ghost story. I think it’s emotionally very powerful. I was able to capture the emotions involved I think (after all, it was my childhood), but technical accuracy still seems to be my critical vulnerability. I wouldn’t worry about the little technical slip. I know something about flying too. Dead-stick (unpowered) landings are certainly possible by light aircraft, but they are not nearly as safe nor as certain as powered ones. Lots of things can still go very wrong. It’s not unknown for a pilot to stall out when encountering an unexpected power line (for example) in such situations. For the past 40 years, 90% of my reading has been Science Fiction. I prefer Hard Science Fiction which can get very technical. It’s been rare when I have NOT spotted a technical flaw. As long as the story is still good, and the logic within the story works, such flaws never stop me from enjoying it. I told you already, I LOVE your short stories. Thank you, Bojana. You are very kind. I’ll just say it was a good story and let the experts recount the technical glitches. Nicely imagined. While technical accuracy is always a laudable goal, it can’t always be the primary consideration in a story. There’s more to storytelling than recounting factual data. That’s why a story can be deeply true even if it isn’t technically factual. I’ve always rather enjoyed making technical errors in storytelling, because it gives experts and enthusiasts to step in and correct them. They share their passion, we learn, everyone wins. Thanks, James! Wow! To see such a backlash for a mere 150 words makes me think twice about contributing. It’s pretty unusual, Grumpy. It was only because I struck a particular nerve. 99% of the time, the responses are really positive. Ooh, nice creepy one! Maybe they’re lingering around because they crashed near a graveyard, already a hotspot of otherworldly energy. For me, the point of the story was the ghostly re-enactment of the crash year after year and even decades later how a sensitive person could hear their last moments. Thanks. The emotional intensity of your story is very clear to me, James. For which I applaud you. The narrative shifts in your story work well.